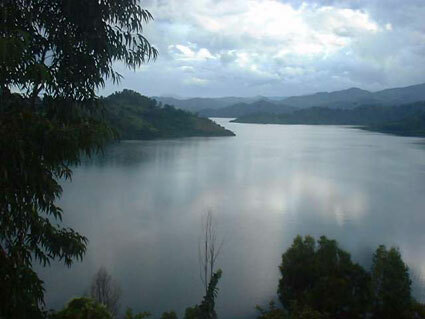 Lake Kivu is one of the African Great Lakes. It lies on the border between the Democratic Republic of the Congo and Rwanda, and is in the Albertine Rift, the western branch of the East African Rift. Lake Kivu empties into the Ruzizi River, which flows southwards into Lake Tanganyika. The name comes from kivu which means "lake" in some Bantu languages, just like the words tanganyika or nyanza. The first European to visit the lake was German Count Adolf von Götzen in 1894. Since then it has been caught up in the conflict between Hutu and Tutsi people in Rwanda, and their allies in DR Congo, which led to the 1994 Rwandan Genocide and the First and Second Congo Wars. Lake Kivu gained notoriety as a place where many of the victims of the genocide were dumped. The lake covers a total surface area of some 2,700 km2 (1,040 sq mi) and stands at a height of 1,460 metres (4,790 ft) above sea level. Some 1 370 km2 or 58% of the lake's waters lie within DRC borders. The lake bed sits upon a rift valley that is slowly being pulled apart, causing volcanic activity in the area, and making it particularly deep: its maximum depth of 480 m (1,575 ft) is ranked eighteenth in the world. The world's tenth-largest inland island, Idjwi, lies in Lake Kivu, as does the tiny island of Tshegera, which also lies within the boundaries of Virunga National Park; while settlements on its shore include Bukavu, Kabare, Kalehe, Sake, and Goma in Congo, and Gisenyi, Kibuye, and Cyangugu in Rwanda.